Two Saturdays ago, I had the fun and honor of being the wedding coordinator for a friend’s daughter’s wedding. It was a great weekend and a great day but by the time I got home at around 6:00 pm, I was ready for some non-talking/non-people time! Nik and the kids had spent the afternoon at Yiayia’s house and Mark fell asleep on the way home. This meant that we had a nice long evening ahead of us. So I headed up to my sewing room and spontaneously decided to make a quilt. I haven’t made a quilt since Mark’s quilt over a year ago. It’s my favorite kind of sewing so I decided it was time for another one. 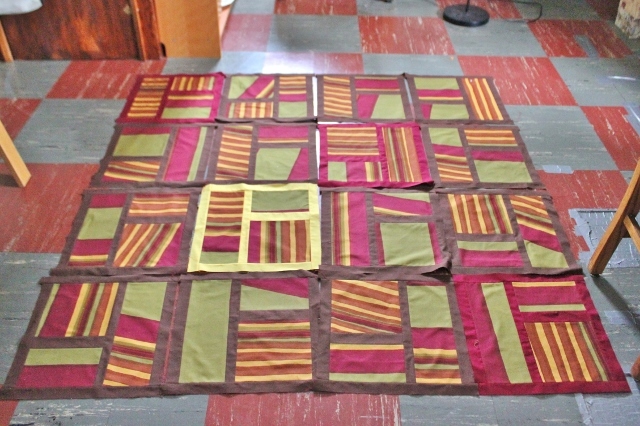 I’m using the measurements from one of the quilts from Patchwork City but just using one fabric for each block (the same fabric, actually, in every block). I’ve been a bit obsessed with sewing this over the past two weeks and I have all the blocks finished! It will be around 70″x70″ when it’s done. Now I just have to sew them together, add a border, make the back, and quilt it! My goal is to have it done by the end of July, just in time to enter it into the state fair. After that, it’s destined to be our “picnic/relax on the lawn” quilt. And in case you’re wondering, yes, I’m definitely an introvert. I can play a pretty strong extrovert when I need to but when I’m tired, give me a book or sewing! This entry was posted in sewing, wedding. Bookmark the permalink. It is beautiful Laura! And you were a beautiful friend as you hepled with so much for Heather and Keith’s wedding! Thank you Anne! And it was my pleasure!